Sugar, Cocoa Solids (Cocoa Mass, Cocoa Butter), Milk Powder, Emulsifier (Soya Lecithin), Vanilla Flavour. 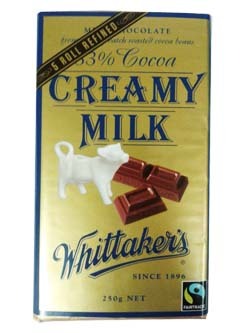 Come on Britain - why can't we make deliciously smooth chocolate like this here in the UK? Nicest, smoothest milk chocolate I've ever eaten. Why can't UK makers match it?